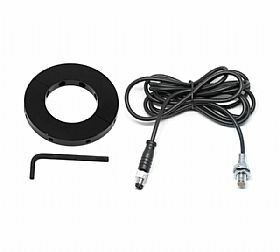 Racepak�s wheel speed sensor and 8-magnet collar is ideal for monitoring wheel speed on the Vantage CL1 data logger. These collars assist in picking up wheel RPM with 8 times the resolution than conventional 1-magnet collars. The kits are available in three popular sizes: 30mm, 40mm and 50mm.